Lauren Pontious showing off Stereo’s new crowlers! Placentia is already home to one (or two, depending on how you count) heavyweight brewery/ies (The Bruery, and the recently opened Bruery Terreux) – both well known in their own right. With that kind of resume, people can help but notice when a new brewery quietly (and paradoxically) explodes on the scene. Stereo Brewing is pumping up the volume in Placentia – with beers for all lips to hear. 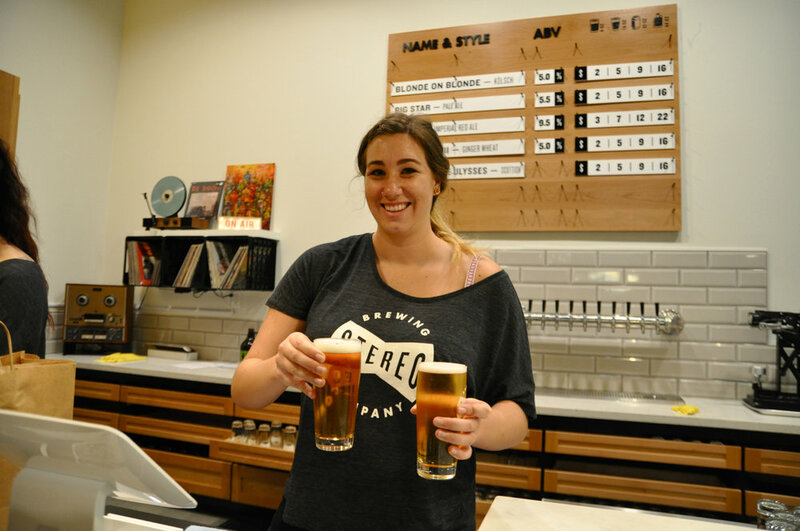 Stereo is an independent brewery run by Rick Smets and Amanda Pearce (Husband + (soon to be!) Wife Team) specializing in a modern remix of classic beer styles, including not only the classic Californian hop forward finesse, but hammering on to eclectic styles (e.g. Scottish Export) and pulling into Blonde on Blonde Kölsch. Beer may the language Rick speaks, but make no mistake, music is the rhythm he moves to. He’s pulled up a throne, tightened up his snare, and is already drumming up some delicious beer. So sit down at the (whammy) bar, and drink up what he has to offer! When robots take over planet earth let’s hope they can be programmed to brew beer that tastes this good! Clocking in at 9.5% ABV, this beer is surprisingly smooth drinking – which is to say, it can sneak up on you if you’re not careful. Deep caramel notes linger on the palate, finishing with a balancing, bitter hop bite that’s just enough to sweep the sweetness off the palate and bring you back wanting more. Androids don’t dream of electric sheep; they dream of eclectic beer. The times, they are a’changing – but, lucky for us, beer styles are immutable. This beer is what you want on a lazy Sunday – relaxing, light, crisp, and clean. On style. On point. In my belly. This is the proper order of events. A refreshing sessionable pale ale brewed with Columbus, Cascade, Centennial and Amarillo hops, this is the first track of Stereo’s premiere album. Clean, refreshing, and true-to-style, this beer is a preview of the promise to keep the band (Big Star) together. Pairs well with long jam sessions filled with face melting music. Do you remember the first time you had Naughty Sauce? How it had this attention-grabbing, never-seen-before draw? It’s not a golden coffee stour, but Hazy Jane is something you’ll never forget. It’s got the bold body of wheat. It’s got a bite of ginger. It’s got the cleansing finish of citric acidity. It’s a Moscow Donkey – a Moscow Mule, but dirtier and more original. I need a growler of this to take to a sushi bar. Try it, and you’ll understand why. Jack Bruce of Cream inspired this true-to-style gallantly tawny Scottish Export Ale. Ulysses is a full bodied ale with rich toasty malt favor and a soft hop character. Plug in the vinyl player, throw on some Slowhand, and relax with the malt that melts you into relaxation.